Your feet and toes take a beating every day--supporting your weight, being stuffed into tiny shoes, getting stubbed on corners. They deserve a treat, and a pedicure is the perfect way to say "Thanks" to your heels, ankles and toes. Softening your toenail cuticles is an important step in making sure your feet are in tip-top shape. Lay down a towel so you don't make a mess on your floor. A soft towel is more comfortable for your feet than cold bathroom tile, anyway. Wash your feet and dry well, especially around your toenails. 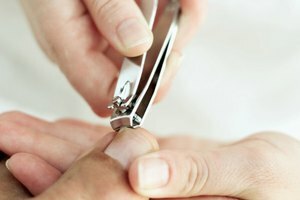 Apply a cuticle remover, which you can purchase at a beauty-supply store or drugstore, to the cuticles on your toenails. Rub it in very well, working around to the back of your toes, where there is a lot of dead skin. Massage your toes and foot while you're at it--adding to the pedicure experience. Repeat on the toenails on your other foot. Rub oil (almond or vitamin E work well), any type of lotion or petroleum jelly onto your toenail cuticles after taking a shower. This helps keep your cuticles moist and healthy, and pedicures won't be critical as often. Think of it as preventative maintenance. Before you turn in for the night, apply a generous amount of lotion or cuticle remover to your toenail cuticles, then put on a pair of comfy socks. In the morning, your cuticles will be as soft as can be.